Gross Weight (GVWR) 5630 lbs. 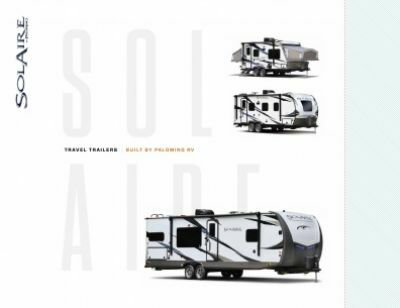 Take a trip across the nation with the 2019 Palomino SolAire Ultra Lite 205SS! In fact, take several! This Travel Trailer is reliable, comfortable, and incredible! You can bring home this RV at a wholesale price at National RV Detroit, Detroit's favorite RV dealer! You'll get the nation's best price guarantee! Visit our Belleville RV dealership at 44700 N I 94 Service Dr Belleville Michigan 48111, or use our 24/7 delivery service across North America to bring this RV straight to your driveway! Give us a call at 734-439-3400 and start your camping plans today! With its GVWR of 5630 lbs. and hitch weight of 546 lbs, this RV can travel across the country without any issues! For some much-needed shade, pull out the 12' 0" awning with ease! At 23' 4" long, and 8' 0" wide, with 1 slides, there's great living space inside! When you're on the road, you don't want to neglect your family's nutrition! And thanks to the super kitchen in this RV with all its modern appliances, you won't have to! Included are a roomy 8.00 cu. ft. refrigerator to store fresh foods and cold drinks, and a 3 burner range cooktop that will let you cook great meals, morning, noon, and night! You'll have enough refreshing, clean water for your family's needs with the massive 50 gallon freshwater tank! The Palomino SolAire Ultra Lite 205SS is packed with so many terrific features, and among them is the beautiful bathroom! With its modern shower and handsome sink vanity, you won't have to trudge to the busy, damp community campground bathroom to enjoy a hot shower, a shave, or a wash! There's a Foot Flush toilet, too! Dirty water and waste are stored in the 38 gallon gray water tank and the 30 gallon black water tank, respectively.